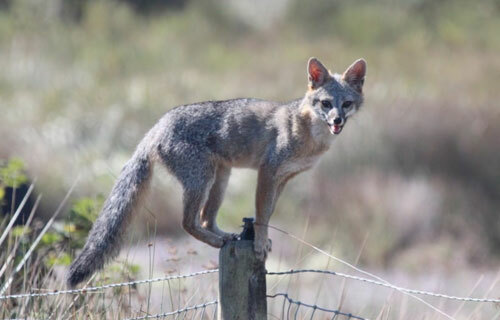 The Department of Fish and Wildlife (CDFW) has determined that a gray fox in Inverness, close to the Point Reyes National Seashore, died of anticoagulant rodenticide intoxication in September 2016. The fox was discovered by the National Park Service (NPS) and necropsy determined that the fox died from internal bleeding. Laboratory analysis identified three different anticoagulant rodenticides present in the fox’s liver. These rodenticides – brodifacoum, bromadiolone, and difethialone – are only legally used by pest control professionals for rodent control in and around man-made structures. CDFW and NPS encourage residents to use alternate means of rodent control, and ask which products are used by pest control professionals they employ. Brodifacoum, bromadiolone, and difethialone are the active ingredients in many rodenticide products used to control house mice and house rats. Predators and scavengers such as foxes are exposed to anticoagulant chemicals when they eat rodents that have been poisoned with these baits. Other wildlife often exposed include hawks, owls, mountain lions, and bobcats. After eating these baits, rodents remain mobile for several days and can be eaten by wildlife or pets. Second-generation anticoagulant rodenticides – brodifacoum, bromadiolone, difenacoum, and difethialone – are now restricted materials in California because of their harmful impact on California’s non-target wildlife. As of July 1, 2014, these products may only be sold to professional exterminators. CDFW urges residents to protect their local wildlife by using safer means of rodent control, such as exclusion and trapping. To learn more please visit our webpage at www.wildlife.ca.gov/Living-with- Wildlife/Rodenticides. For more information, please call or email the CDFW Wildlife Investigation Laboratory. Call (916) 358-2954 or e-mail stella.mcmillin@wildlife.ca.gov.